Burnley boss Sean Dyche has confirmed that there's "something in the offing" in relation to striker Lukas Jutkiewicz's proposed move to Birmingham City. Reports have suggested that a deal has already been agreed between the two clubs to sanction a permanent move for the 27-year-old, though Dyche suggested that discussions were still building. Jutkiewicz, who joined the Clarets from Middlesbrough in the summer of 2014 in a deal worth £1.5m, sealed a loan move to St Andrews on deadline day having expressed a desire to play regular football. 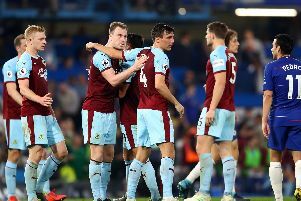 The striker only made 13 league starts at Burnley and struggled to get off the mark in competitive action but he's rediscovered his goal-scoring form with the Blues. Five goals in 17 appearances in all competitions has seen Jutkiewicz establish himself as a regular in Gary Rowett's starting XI. A fee in the region of £1m has been earmarked for the towering forward, whose contract at Turf Moor expires at the end of the current campaign. "There is something in the offing so we'll find out more soon," confirmed Dyche. "There is something that is building up that might get there. We'll see. "He's been a good individual to have around the place and he's been good with the players but he wanted to play regular first team football. I thought that was best for him as well as us. He's gone out and I think he's enjoyed his time there."